Love My Maids provides Haslet with high-quality, reliable cleaning service from maids who are insured and bonded. We understand that maintaining a clean home on a regular basis takes a lot of time and effort. Our maids will provide you with dependable cleaning services so that your Haslet home stays spotless all year round. Instead of having to gather supplies and spend valuable time cleaning, you can let our team handle it for you. When you depend on Love My Maids, you can rest assured that you’re getting quality service from highly trained professionals. Since our maids are all insured and bonded, you can be sure that your home is in good hands. We look forward to helping you keep your home clean. Having your Haslet home routinely cleaned by our Love My Maids team means that you and your family will have more free time. Rather than having to devote time to handling cleaning tasks yourself, you can make plans to explore all that Haslet and the surrounding area has to offer. You’ll also have more time to relax and unwind after working all day instead of having to come home and clean. With the time that you save by hiring our maids to handle your cleaning, you and your family can enjoy some fresh air at Haslet Community Park. Play a round of disc golf or work on your sand volleyball skills. You can also explore the park’s walking trail or have a family picnic. You’ll even have enough time to plan an outing in nearby Fort Worth, which is only a 30-minute drive away. Keeping your office as clean as possible is essential for both you and your employees. A clean office also makes a positive impression on clients and customers, which can boost your business. Love My Maids in Haslet has a team of maids that are experts in office cleaning. We’ll clean around your schedule – whether you need daily cleanings, weekly cleanings, or a custom schedule. 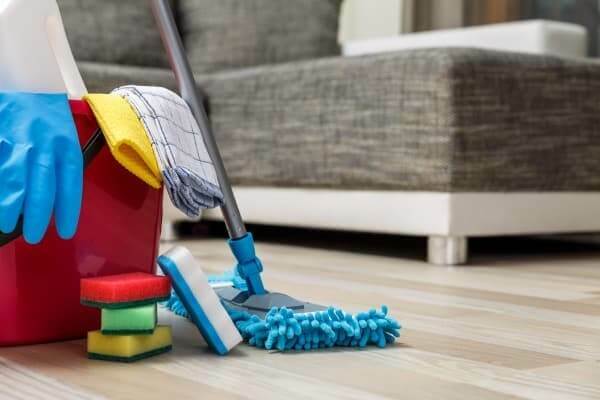 Our maids take care of a number of cleaning tasks to keep your office clean so that your employees are more comfortable and so it makes a great impression on customers. The office cleaning services that we provide to Haslet offices include dusting, vacuuming, mopping, removing trash, and polishing office furniture. Our maids will also ensure that bathrooms, kitchens, break rooms and other common areas are wiped down and sanitized, which helps prevent the spread of germs throughout your workplace. When you decide to hire Love My Maids to clean your Haslet home or business, you’re getting outstanding quality from a team of caring professionals. Love My Maids has been providing cleaning services for Texas homeowners and business owners since 2014. Customers who have hired our maids to keep their home clean have praised the service they receive. Our maids are described as reliable, courteous, and kind professionals who go above and beyond to make Haslet homes as spotless as possible. In just a few short years, Love My Maids has established a solid reputation as a quality cleaning company in the Haslet area. We have been rated the Best of 2016 by Thumbtack, and Home Advisor has also named us a Top Rated business. We are a BBB accredited company with a strong sense of pride in giving back to our community. Love My Maids is a Proud Partner of Cleaning for a Reason, a non-profit that provides cleaning services for women who have cancer. If your home or office in Haslet is in need of cleaning, contact Love My Maids to book our services at (817) 697-3136. Whether you need regular cleanings or a one-time cleaning, you can count on Love My Maids to provide you with dependable service. Love My Maids is proud to be a veteran-owned company that offers dependable cleaning services to customers throughout Haslet. We also use green cleaning products to help protect the environment and keep your home as pollutant-free as possible. Please contact us online to schedule your cleaning. If you would like more information about our services or our company, we’ll be happy to assist you.